We realize it took everything extra you had to get your setup going, but one thing many people overlook in building a reef tank is quarantine. In reality, best management practices are to quarantine everything, all the time. Fish, coral, or inverts ... in an ideal world they would all be quarantined before putting them into your setup. In general, a store does this for you (to varying degrees) by keeping the fish or coral a week or two, more is better, making sure it is eating and not carrying disease. This is what you are paying them for. But, there are many internet sellers that may work out of a wholesaler&apos;s building, especially in L.A., and when they ship a fish or coral, they "grab one" at the wholesaler (sometimes = &apos;downstairs&apos;) and ship it to you, without it being quarantined. Fresh raw fish ... ocean to you, which is a good way to learn more than you wanted to know about fish diseases. Although most fish are generally in systems that run with copper, they often haven't been in it long enough to call it quarantined. And many types of fish which are copper sensitive are kept in seperate or invert systems. In either case, they have been swimming around with many fish in a big system, constantly getting new fish put in it daily, some of which just about have "bugs" jumping off them all day. This is why in many cases buying from your local store is the best option. While at the wholesaler, many fish are only barely fed and there is little individual attention given to individual fish at the wholesale level, unless they are expensive. On the other hand, when you buy a fish from a local store, you can see that it eats and you can be as sure as possible that it is disease-free. Still, you should quarantine it if at all possible so you can study it long, hard, and closely before you put it in your system. Much less for something you got on-line for which you have no idea how it was being housed! Remember it ranges from very hard to nearly impossible to get some fish out of a reef setup. So, taking the time to study your fish prior to introducing them to you reef makes good sense. 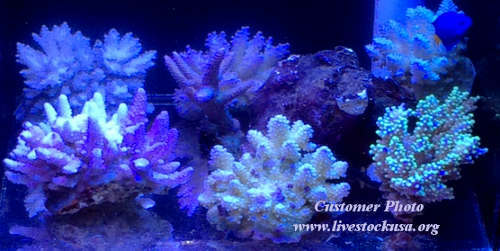 Even with corals it is best if you can quarantine them. It is in theory fully possible for a coral to carry ich or some other parasite, harmful bacteria, or who knows what on it. Though it would be hard to confirm any given case, it could happen. Usually after a couple of weeks in QT, if any potentially dangerous issues are present, they will have likely shown up; or more likely, as far as possible fish parasite or diseases go, expired due to lack of host. A coral QT system of course requires more than a fish QT system (some kind of acceptable lighting), but if you have a big setup, you should seriously consider it. Certainly corals in general do not pose the threat that fresh new fish do though. The alternate method, let&apos;s call it the "poor man&apos;s QT," is to dip. Dip everything on arrival before putting it in your tank, first time, every time, all the time, no exceptions, if you are not quarantining. There are a few coral dips available, and you should have and use one when you are putting new livestock in a tank. All corals should be dipped as a matter of standard procedure, as a prophylactic sanitization method prior to placing in your setup. But with fish too, dip them after acclimation before placing in your aquaria, for which copper or formaldehyde work well on certain things. Always have an airstone in the bucket to make sure the water has plenty of oxygen and movement. A stagnant bucket can run low on ox way faster than you might think. Always remember to rinse any dipped item in a seperate bucket of tank water after the dip, before you put your new charge in its new home. Never allow dip (or acclimation) water into your tank, and never put any store or otherwise foreign water into your system. You don&apos;t know where it has been. Or what has been in it. The age-old store advice to have you float, then cut the bag and slowly add water, is way too dangerous for me. They should not be doing it that way either. The only purpose of floating bags is temperature adjustment, on a sealed bag. Acclimate (see our articles on fish or coral acclimation), then dip, rinse very well, then try to figure out where it will look best. Watch for nose prints on glass. If you get a problem on a fish, of course the worst thing to have to do is treat the tank, so again, a QT system, or then hospital tank, is called for, even if just a 10-20 gallon. Usually I just keep one rock in there for some habitat to comfort the animal, but generally a bare floor is best, and once you have medicated or treated, make sure you never mix any substrate or that piece of rock into your system. Rock absorbs medications and chemicals such as copper. For wrasses or other sand dwellers, use a small bowl or tray with some sand, making sure to know not to mix that sand with other sand, ever. If or when you pull it out, bag it and label it (with skull and crossbones - ;)) so you know that is your medicated, or coppered, hospital sand. If you have a big tank, you will need to trap any fish that gets sick if you can&apos;t trick him into a net easily. Often by the time you notice you have a problem, it has gotten bigger than you think. Believe me, a QT tank that is usually unused is often an easier thing to have to do than get a fish out of a tank. In a pinch you can use that trash can or tub you use for making saltwater for a QT or hospital tank. I've done that and used things like a power head with sponge, H.O.T. Magnum, or Bak-Pak filter, (or combo thereof) to run it (besides heat and light). Although skimming might remove some things you treat with, so find out if that is the case with what you are using, if you are skimming. Of course never use carbon in a QT or hospital system, it takes chemicals and medicine out of the water. So, consider acquiring the few items you need to have a basic QT or hospital tank for ensuring you don&apos;t inadvertently introduce unwanted pests or disease. Used is a good way to get what you need for something you won't use often. You don&apos;t want to have to run pieces or parts down when you find out you need them. You would not live without a first-aid kit, which you usually don't need or use, and a QT or hospital tank is just that for your fish or reef system. A five or ten gallon tank can house most fish for a short while. Always make double sure they are VERY well covered (completely - use kitchen plastic wrap or some such to close any gaps or openings). Fish jump, especially from small tanks, and for some reason they think the whole world is water. You need a small tank of 5, 10, or 20 gallons, a powerhead with sponge or small filter to move water, a heater and any basic light. Supermegamart sells daylight (6500 Kelvin) fluorescent tubes and cheap small fixtures. Make sure your current stirs the surface well to keep water well-oxygenated. You will need it while stocking the tank, and then you can drydock it. If you run into trouble with sick fish, the best thing to have is knowledge of where to get solutions. The local store you patronize is one good bet. I hope too everyone knows their local marine aquarium societies, they often have message boards where you can post questions and get quick answers from the local pros. Reef Central is a good message board with lots of helpful nice folk too. You might want a few opinions to decide which course of action is best for your situation. And consider too as a resource to check the archives at these venues, which will often get answers without even asking questions on the board. Many problems have been gone over before (you are probably not the first ), some many times with lots of great ideas about fixing them. Always QT everything if at all possible. Otherwise always dip everything.